TubeNet • View topic - Replacement lead pipe for Yamaha YBB 103? Replacement lead pipe for Yamaha YBB 103? I just picked up a sweet YBB 103 project horn that should make for a great restoration, once it has a new lead pipe! The current one has had the first 3 or 4 inches (including the receiver) cut/ripped off! (before I got it) Just for kicks, i will probably try to re-attach the two pieces with a wrap around patch, but that would just be for personal practice. 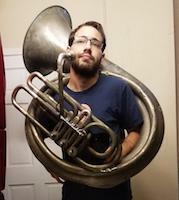 I know this is a long shot, but would any of you tuba gurus have a non-ripped/torn leadpipe laying around that could get this classic horn back in action? I can handle reasonable dents and am happy to pay a reasonable price! I realize that the solution could also be to have a local tech bend a new one for me. If I do go that route, would anyone be able to give me a reasonable ball park estimate for that kind of job so I know what to expect before walking in? Re: Replacement lead pipe for Yamaha YBB 103? Yep, I’ve got one, still on a horn. I’ll take pics of it later today. If you’d like, could you PM me your cell number or email address to send them. I was sweating bullets after you posted that because I already had an open offer on it! I did end up getting it and it looks like my friend YORK-aholic is going to be selling me a parts horn that should get both of the 103s back in action! I can't believe how helpful this forum has been in getting these classic horns back on the beat. Hope you get them both playing. They're great little horns with alot of oomph for their size. Good luck. Those parts are packaged and will be in Monday's mail.